API was just nominated! Vote for API at Babble.com for the 50 best Facebook fan pages that ease the load of parenting. Search, or sort alphabetically, for Attachment Parenting International and there you can click "I like this"! It's a great way to let parents know about the positive support and information API offers. Wishing you all the blessings of the season and this special time with your family. API staff and volunteers will be celebrating with their families and on break from December 20 through January 2. Many services will remain available, though responses may be delayed. Thank you for your understanding. Will you support API's mission with a 2010 contribution? Your donations help us to reach millions of families through web and support groups. With your help, we can continue supporting families like yours with information and programs. Please make your gift today. While many debate what attachment parenting is, this short video written and produced, and song composed and performed by our creative and passionate Board Member Lu Hanessian, captures the essence. Please enjoy this special video gift to you from the heart of API. API is honored to be the recipient of a grant from the Saban Family Foundation in support of furthering API's mission. Read more about Foundation Trustee and AP mother Heidi Stills and this grant to API. Purchase 5 teleseminars for $40 with a new family membership today. That's $5 off! API Resource Advisory Council member and API Editorial Review Board member, Kathleen Kendall-Tackett, PhD, IBCLC, RLC publishes with Zhen Cong, PhD, and Thomas Hale, PhD, important study on infant sleep and parent's need for safe sleep information in Mother–Infant Sleep Locations and Nighttime Feeding Behavior: U.S. Data from the Survey of Mothers' Sleep and Fatigue. Please be familiar withimportant measures for sleep no matter where your infant sleeps, provided in API's Infant Sleep Safety brochure. Download copies free of charge to distribute in your community or visit the API store to purchase them at a nominal cost. API is pleased with the stance of the CPSC to educate parents on safe babywearing and recognize the long-held beneficial and safe practice of babywearing. CPSC's statement on educating new parents on safe babywearing: http://www.cpsc.gov/cpscpub/prerel/prhtml11/11044.html. For additional information on safe babywearing, please see the API Statement to the CPSC on Babywearing, visit a local API Support Group for babywearing assistance, or read and distribute the safe babywearing brochure, available free of charge as a download and for a nominal cost in the API Store. The Wall Street Journal and Erica Jong comment on attachment parenting. API responds, and invites you to respond. Let the Wall Street Journal know who you think is qualified to speak about attachment parenting and mothers in the workforce. Muster your best NVC* and send a letter letting WSJ know how AP has empowered you as a mother and professional, given you freedom, confidence, or express whatever is on your mind. Want some ideas? Draw freely from API's responses, along with the Sears, to the Nov. 6 article and video. Watch for an API's upcoming essay in response, and blog post getting to the heart of the matter. Come join API's book club, API Reads, as we read and discuss The Heatlhiest Kid in the Neighborhood. Pediatrician Sears and his wife, Martha Sears, R.N., have written another handbook in the Sears Parenting Library, this time coauthoring with two of their sons, pediatricians James and Robert. The Searses are concerned about children's nutrition, as they see an increase in obesity and other typically "adult" conditions: Type 2 diabetes and heart disease. Come join with us as we take the journey into making healthy changes in our families. Purchase the book from API's store and receive a free download of the teleseminar "Full of Love" by Dr. Sears himself. Getting assistance from an experienced support person who is familiar with soft carriers. NASHVILLE, Tenn. - October is a good month to give an extra hug in Tennessee during "Attachment Parenting Month." Research shows a strong parent/child bond can give young people the tools to make healthy choices and help them overcome obstacles as they go through life. Artemesia "Art" Yuen, development coordinator and board member of Attachment Parenting International, says emotional, financial or physical problems are more easily solved when children are supported and encouraged. "When a child and a parent experience attachment, it doesn't mean that they're guaranteed to be spared any harmful events in the future, but generally what it does promote and does serve to benefit is a child's resilience." Yuen says when children receive love and support from their parents it can help them avoid unhealthy lifestyle choices. "Through that loving relationship, we can offer to them healthier physical habits and generally use a strong connection to help them avoid the attachment to junk food or sedentary activities." More information is available at www.apmonth.attachmentparenting.org. Attachment Parenting International is conducting an online auction fundraiser until Oct. 17. API Resource Advisory Council Member Bill Corbett's parenting book Love, Limits, & Lessons: A Parent's Guide to Raising Cooperative Kids has been awarded the "Parent Tested, Parent Approved" Media Inc's Seal of Approval for excellence in family products. Click the image. Take the plunge. Start a ripple. "Especially once you came along, Hayden, having three older ones and a new baby, I wish I had known..." and because of Martha Sears we do know and share the message of parent support. WASHINGTON, D.C. - The U.S. Consumer Product Safety Commission (CPSC) and the U.S. Food and Drug Administration (FDA) today warned consumers to stop using infant sleep positioners. Over the past 13 years, CPSC and the FDA have received 12 reports of infants between the ages of 1 month and 4 four months who died when they suffocated in sleep positioners or became trapped and suffocated between a sleep positioner and the side of a crib or bassinet. Attachment Parenting International, a non-profit global network of parenting support groups with more than 60 chapters in North America, along with partners, AskDrSears.com, Mothering Magazine, Infant Massage USA, Dr Sears L.E.A.N, the International Childbirth Education Association, Lamaze International, and Attachment Parenting Canada, launch the third annual Attachment Parenting Month, celebrated around the world according to this year's theme, "Full of Love: Parenting to meet the emotional and physical needs of children." Buy 1 Membership and Get One Free!! A gift for the holidays? Finances tight? Why not pair up with a friend or family member to split a membership together? It's been another hard year for many causes. The approaching holiday season gives us a chance to help Attachment Parenting International. It requires your participation, but it's free and definitely easy. iGive.com is going to attempt to donate $5,000 in just 24 hours to Attachment Parenting International and other causes. For each person who joins iGive using the special link below and does just one qualified web search on our site between now and noon. Thursday, September 30, 2010 (Chicago time), we'll give Attachment Parenting International a dollar. So, a simple join page and then do one search, then API gets $1. Share this information now if you care to help Attachment Parenting International. We hope that it'll turn into much more, as these new members shop and search during the holidays. If these new members search more (or buy something at an iGive store) they'll earn even more money for Attachment Parenting International. Right now, we're donating a $.01 per search and a bonus $5 for that first purchase plus the usual percentage. Here's where you come in. The only way Attachment Parenting International will get new supporters and that free $1+ is if you invite them. Send your friends, family, and colleagues the following link in an e-mail, tweet it, do a Facebook posting, put up posters, shout from mountain tops (you know the drill) and let them know you think Attachment Parenting International is pretty cool and deserves their support, especially since it's free! If you wish to shop and help Attachment Parenting International this holiday, you can choose from eBay to Amazon, iTunes to Home Depot, Staples, JC Penney, Expedia, and about 800 other great stores. Offer active between now and 11:59 a.m., September 30, 2010 (Chicago time). New members only (never have been an iGive member previously). All the normal rules of membership, searching, and purchasing apply, our site has the details. Once we've given away $5,000 in total, the offer ends. The special link is important. No link, no qualified web search, no $1. That's it. Don't forget to try our search yourself (http://isearch.igive.com). You may need to login first. API presents Close to Your Heart: Tips and Safety Information for Infant Babywearing, a color brochure to assist families with helpful information on safer and comfortable babywearing. The brochure is available free of charge for download in both color and grayscale versions. It will also be available for sale at minimal cost as a glossy brochure in the API Store. Help distribute this important information in your community. Watch an announcement on an upcoming teleseminar on babywearing and find more babywearing support on API's website and from local API Support Groups. The Happier Kids Now Online Expo is a FREE Parenting Interview Series hosted by Rhonda Ryder and Patrick McMillan providing a wealth of life-changing information from 24 happiness, self-esteem, health and education experts. It's specifically designed for parents, teachers and homeschoolers. And, when you sign up for access to the event (at zero cost! ), you'll receive a complimentary copy of Patrick's popular Ebook, The Ultimate Kids Guide to Happiness. The line-up of speakers is incredible and includes Bob Proctor, Bruce Lipton PhD; Marianne Williamson; Bob Doyle; Marci Shimoff, Sonia Choquette; Dr. Joe Rubino, Dr. Dan Yachter, Scott Noelle...plus 17 more! These leaders will cover current challenges such as child obesity; child/teen depression; ADHD, autism and nutrition; how to help kids do better in school...special trainings for teachers...and solutions such as teaching kids the power of their minds; emotional intelligence, character building, positive parenting, happiness (emotional well being) curriculum in schools and so much more. As you probably would agree, many parents and teachers are stressed out and overwhelmed these days. This leaves its toll on kids and teens. Plus, statistics show childhood anxiety and depression levels are rising at alarming rates. Giving parents and teachers the strategies and tools to instill optimism and self-confidence in their children and teens is the mission of the Happier Kids Now Online Expo. So don't miss out. Get your FREE Online Pass to this amazing event - plus the Ebook now! Register now for the Coalition for Improving Maternity Services' (CIMS) webinar, "'Thank You for Listening to Me': Trends and Patterns in the Results of The Birth Survey" on Tuesday, September 21st from 11:00am-12:15pm EST. The program will explore women's response to CIMS' The Birth Survey. If you have a Sorelle crib, Prescott Model, you are urged to stop using it immediately. Parents are urged to check the recall list for infant products regularly. We have launched our new TELESEMINAR membership package. API Membership Teleseminar Package includes all the membership benefits plus five API Live Teleseminars of your choice for only $75. Save $5.Purchase today! August 10, 2010 - Attachment Parenting International today announced its newest Board of Directors member, co-author of numerous Sears Parenting Library books and longtime API advisor Martha Sears. "I am honored to join the API Board of Directors," said Sears. "I have enjoyed my time on the API Advisory Board and will continue with new contributions on the Board of Directors." Sears is the co-author of 25 books, drawing on 18 years of breastfeeding experience including a child with special needs and an adoption. She is the mother to eight children, one of whom has Down Syndrome and another who is adopted, and is an frequent guest on numerous television talk shows. "I'm thrilled to have Martha on the API Board," said Janet Jendron, president of the API Board of Directors. "We've been friends for over 30 years when she lived in South Carolina as a newly accredited La Leche League Leader, and more recently as she and Bill have been an incredible support to API. We've shared tears, laughter, prayers and hard work together. She brings her beautiful, vulnerable spirit and her passion for truth and excellence to everyone and everything. I've loved watching her as a mother, grandmother and wife! The API Board is blessed to have her wisdom, commitment and expertise as we move into a very exciting future." Sears is part of an impressive group of API board and advisory board members, including Dr. William Sears, noted author of multiple parenting books and AskDrSears.com; author and co-sleeping specialist Dr. James McKenna, pediatrician and author Dr. Jay Gordon, Lu Hanessian of LetTheBabyDrive.com, and Jan Hunt of the Natural Child Project, among others. August 10, 2010 - Attachment Parenting International today announced its newest Resource Advisory Council member, Attachment Parenting Canada founder, and best-selling author of Discipline Without Distress Judy Arnall. "I am very honored and privileged to join the API Resource Advisory Council, and I will contribute current research and best practices on Attachment Parenting as they become available in Canada," said Arnall. Arnall is founder and director of Calgary-based , which provides support and education to parents in Canada through classes, support groups, consultations, and more. She is also the mother to five children, the best-selling author of the book Discipline Without Distress: 135 Tool for Raising Caring, Responsible Children Without Time-out, Spanking, Punishment or Bribery, and an often-quoted and sought-after parenting expert in Canada and around the world. She also teaches parenting at The University of Calgary, Continuing Education and also with Alberta Health Services. "Judy has been a committed advocate for children and families for a number of years. It is an honor to have her experience and expertise on the Resource Advisory Council," said Lysa Parker, co-founder of API. "She will be a tremendous asset in helping to guide the direction of our organization." Arnall is the newest of an impressive group of API board and council members, including Dr. William Sears and Martha Sears, R.N., noted authors of multiple parenting books, speakers and founders of AskDrSears.com; author and co-sleeping specialist Dr. James McKenna, pediatrician and author Dr. Jay Gordon, Lu Hanessian of LetTheBabyDrive.com, and Jan Hunt of the Natural Child Project, among others. API Resource Advisory Council members are experts in their professional fields, giving advice, lending their expertise, and supporting the mission and vision of API. "I think kids need two things — reliable warmth, and they need reliable availability. The caregiver doesn't have to be warm all the time, but they need to be reliably warm. They don't have to be available all the time; they need to be reliably available." August 2, 2010 - TheAttachedFamily.com is now available to the public without a login. Why? Well, we couldn't keep up with the password! Seriously, though... Originally, the online magazine was created to economically expand the information provided to API members. However, what we've found is that the online magazine has become such a great resource that we felt we just had to share it with everyone. We hope you enjoy it and that you consider joining API to receive the quarterly print magazine for exclusive articles, or giving a donation to API to continue this service. August 1, 2010 - Become a member today and receive Jan Hunt's MP3 for FREE along with continued FREE viewing of our amazing electronic version of The Attached Family! July 18, 2010 - Suite101 recently posted a review of Barbara Nicholson and Lysa Parker's book, Attached at the Heart. Attached at the Heart is a great place to get an overview of what Attachment Parenting means and what it looks like in practice. Parents who choose to parent in this style will most likely come up with questions or need more detail in certain areas, such as gentle discipline. The resource lists at the end of each chapter provide an excellent springboard to further reading on Attachment Parenting. Dr. Hale's InfantRisk Call Center is now open! July 17, 2010 - The InfantRisk Center is now open! The national call center will answer women's and their healthcare providers' questions about the use of specific medications during pregnancy and breastfeeding/lactation with the most up-to-date, research-based information. (The number is 806-352-2519.) The InfantRisk Center is the brainchild of Thomas W. Hale, PhD, RPh, Professor of Pediatrics, at Texas Tech University School of Medicine, and it is located in the Texas Tech University Health Sciences Center Amarillo and Laura W. Bush Institute for Women's Health. More in this news video! July 8, 2010 - API Links: July's AP-related news, studies, events and fun is now available! View it now, seepast issues, or subscribe to this free eNewsletter. July 7, 2010 - Become a member today to enjoy a FREE electronic version of our most recent issue of The Attached Family with its NEW look and articles on EVERY Parenting Principle. July 3, 2010 - Unfortunately, API doesn't meet the criteria for Oprah's programming search, but we'd still like your help in sharing our important message about evidence based parenting information support. We think the medium of TV suits the cofounders well - don't you? Please comment and share the link. June 3, 2010 - WASHINGTON, D.C. - The U.S. Consumer Product Safety Commission (CPSC), in cooperation with Sprout Stuff, of Austin, Texas, is announcing the recall of about 40 Sprout Stuff infant ring slings. CPSC advises consumers to immediately stop using these slings due to a risk of suffocation to infants. The Sprout Stuff infant ring sling is fabric/natural muslin and comes with or without a shoulder pad. The sling is worn by parents and caregivers to carry a child up to two years of age. "Sprout Stuff" is printed on the back side of the tail's hem. Consumers should immediately stop using the recalled slings and contact Sprout Stuff to return the sling for a full refund. Contact Sprout Stuff toll-free at (877) 319-3103 anytime, email the firm atsproutstuffrefunds@gmail.com or contact the firm by mail at Sprout Stuff Refunds, P.O. Box 612, Buda, Texas 78610. June 1, 2010 - Buy 1 new membership and receive 50% off the book Breastfeeding Facts for Fathers! May 14, 2010 - Don't miss this interview of Joan Almon by Enola Aird! Barbara Nicholson says, "It's so right on about why we must honor childhood by protecting out children ever more fiercely from commercialism and exploitation." Next month, on June 16, Enola interviews Barbara and Lysa Parker. Working Mother - Baby Slings: Are They Getting a Bad Wrap? April 6, 2010 - API Co-founders Barbara Nicholson and Lysa Parker recently wrote an article on baby slings for Working Mother magazine. One of the earliest inventions of humankind is now under scrutiny - the baby sling. On March 12, 2010, the Consumer Product Safety Commission (CPSC), issued a warning stating that "slings can pose suffocation hazards to babies," The statemen came uncomfortably close, in the eyes of many babywearing advocates, to staining all slings with the same stigma which may only prove to scare parents away from using any slings. Read the entire article: Baby Slings: Are They Getting a Bad Wrap? Hot Indie News recently posted a review of Barbara Nicholson and Lysa Parker's book, Attached at the Heart. No other parenting book is as comprehensive in its scope, from an overview of attachment theory and current child development research to practical strategies for everyday situations. 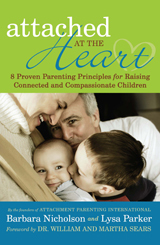 Attached at the Heart is a vital blueprint for change that begins in the home. Washington, DC—The United States Breastfeeding Committee (USBC) applauds the passage of the health care reform package, in particular, the workplace breastfeeding support provision in the Patient Protection and Affordable Care Act. The provision states that employers shall provide reasonable, unpaid break time and a private, non-bathroom place for an employee to express breast milk for her nursing child for one year after the child's birth. Employers with less than 50 employees are not subject to the requirement if it would cause "undue hardship." USBC Chair, Joan Younger Meek, MD, MS, RD, IBCLC, applauds the legislation's recognition of breastfeeding as a major preventive health care strategy. "Mothers, babies, and employers all win with breastfeeding support," says Dr. Meek. "Research clearly demonstrates the value of breastfeeding for the health of women and children, and medical experts agree with the U.S. Department of Health and Human Services (DHHS) in recommending exclusive breastfeeding for six months and continued breastfeeding for the first year of life and beyond. But returning to work can be a major hurdle for new mothers struggling to balance working and breastfeeding without the simple support measures this law ensures." Although many are aware of the health benefits of breastfeeding, employers may not recognize the economic benefits that accrue to them also. The Business Case for Breastfeeding, published in 2008 by DHHS, demonstrates an impressive return on investment for employers that provide workplace lactation support, including lower health care costs, absenteeism, and turnover rates. Employees whose companies provide breastfeeding support consistently report improved morale, better satisfaction with their jobs, and higher productivity. As part of The Business Case for Breastfeeding initiative, coalitions in 32 states and territories received training to assist employers in establishing lactation support programs. Dr. Meek says it takes little for a company to provide lactation support. Basic needs include a clean place to express milk in privacy and break time to express milk approximately every 3 hours during the work period. A model law in Oregon defines reasonable time for milk expression as 30 minutes for every four hours worked; a good match between natural breastfeeding cycles and the rhythms of the workday. Meek adds that a growing number of companies across the United States offer worksite lactation programs that also include access to information and professional support from a lactation consultant or other health experts. Currently, 24 U.S. states, Puerto Rico, and the District of Columbia have legislation related to breastfeeding in the workplace. The new federal provision will provide a minimum level of support in allstates, but it will not preempt a state law that provides stronger protections. "This looks to be a strong legal provision, providing for and protecting nursing mothers in the workplace," says labor and employment attorney Thomas Doyle, JD, of Portland's Bennett Hartman Morris and Kaplan. "The implementation of this law will help women care for their babies while contributing to the U.S. workforce." After championing the most detailed of the state workplace support laws in Oregon (passed in 2007), U.S. Senator Jeff Merkley introduced "Reasonable Break Time for Nursing Mothers" as an amendment to the Senate HELP Committee's health reform bill last year. Amelia Psmythe, Director of the Breastfeeding Coalition of Oregon, celebrates Senator Merkley's impact on shifting the paradigm to recognize that: "Breastfeeding is the natural outcome of pregnancy, and workplace support is the natural outcome of a society where the majority of mothers and babies are separated due to work." Although the law was effective immediately upon President Obama's signing of the Patient Protection and Affordable Care Act, the U.S. Department of Labor must now work to define terms and enforcement procedures. USBC will be closely monitoring and supporting this process and stands ready to support employers and breastfeeding employees with tools, information, and resources. Employers, human resources managers, and breastfeeding employees who are interested in helping to establish worksite lactation programs at their place of employment can find additional information and Frequently Asked Questions on the USBC Web site. For more information and to access copies of The Business Case for Breastfeeding resources, visit The National Women's Health Information Center. To locate health care providers and knowledgeable breastfeeding support personnel that can offer assistance and answer questions about breastfeeding, visit the Breastfeeding FAQs page on the USBC Web site. USBC is an organization of organizations. Opinions expressed by USBC are not necessarily the position of all member organizations and opinions expressed by USBC member organization representatives are not necessarily the position of USBC. March 29, 2010 - The Consumer Products Safety Commission's warning on baby slings provides vague and misleading information for parents. The popularity of slings has increased tremendously in recent years, as more and more mothers report that slings facilitate parenting and breastfeeding on demand. "All slings are not created equal," says Arthur Eidelman, MD, vice president of the Academy of Breastfeeding Medicine. "Unfortunately, however, the CPSC issued a blanket warning about all types of sling carriers." Ring slings, which carry infants in an upright position snug with the parent's chest, protect the infant's airway. By contrast, the illustrations of "unsafe" slings in the CPSC warning appear to be bag or duffle slings. In bag slings, the infant is carried near the parent's hips. In this position, the infant may be curled up and the neck may be bent, making breathing more difficult. The CPSC's advice on safe baby carrying is also misleading. The agency recommends positioning infants so "the baby's head is facing up and is clear of the sling and the mother's body." "The face out position they say is correct could be risky with a premature infant, because of the baby's unsupported neck," Eidelman says. "A baby whose face is sideways with cheek against the chest, head slightly extended and body and shoulders and yes, face, snug so that the baby can't move, is secured in a safe position." In the warning, the CPSC reported 14 deaths associated with sling use in the past 20 years, including 3 in 2009. The agency provided no information on the types or brands of sling involved, nor did they account for the rapid increase in sling use among parents in the US. This stands in contrast with the hundreds of recalls of other juvenile products issued by the CPSC that specify the precise brand and model number involved in adverse outcomes. "Last month, when the CPSC recalled a crib model associated with 3 infant deaths, they did not issue a blanket warning that cribs can be deadly," Eidelman notes. "Parents deserve the same precise, accountable information when it comes to baby-carrying." Are Slings Getting a Bad Wrap? One of the earliest inventions of humankind is now under scrutiny- the baby sling. On March 12th the Consumer Product Safety Commission (CPSC), issued a warning stating that "slings can pose suffocation hazards to babies" coming uncomfortably close, in the eyes of many babywearing advocates, to staining all slings with the same stigma which may only prove to scare parents away from using any slings. Read the entire article: Are Slings Getting a Bad Wrap? March 26, 2010 - In article which appears in The Wichita Eagle, API Co-Founder Lysa Parker urges parents to look at the whole picture when it comes to using slings. "It is such a growing phenomenon," Parker said. "We hope parents will make decisions based on the complete picture, not fear." Suzanne Tobias, author of the article, is actually a happy sling user herself. Slings, when used properly, can be a fabulous tool. Mine was indispensable during my son's first year, when he needed to be held and nursed and his 3-year-old sister was running free. A patient, experienced friend showed me how to use my sling, and once I got the hang of it I used it in grocery stores, on planes, at the zoo, everywhere. March 26, 2010 - API Co-Founder Lysa Parker was recently interviewed by Tara A. Trower for an article on the recent sling recall. In her article, which appears on The Statesman website, Parker says, "Babywearing is a practical way of meeting an infant's need for closeness and safety," she said. "We know that all slings are not created equal. Parents must follow instructions and the DVDs that often come with them. I've talked to parents who said ‘I didn't have time to watch the DVD" and it turns out that they may be wearing their slings improperly." Read the entire article: Advocate: Slings still have place for parents despite recall. There are so many benefits to wearing your baby in a sling, if you are cautious and use common sense, wearing your baby will be good for you and your baby. Read the entire article: You can sling your baby and co-sleep safely. Yes, you can. March 24, 2010 - "Today we received news of the Infantino sling recall, and the Today Show interviewed one of the mothers whose baby died in the sling. We are deeply saddened by this mother's story of her baby's death," said Barbara Nicholson, API Cofounder. "And hopefully this recall will heighten every parent's awareness of the importance of proper positioning of their baby in a sling. Safely using a sling is a key issue, and parents need to be cautious as they would with a car seat, walker, or any device and closely follow manufacturer instructions. As we say in the API statement on babywearing safety concerns," Nicholson concluded, "Our hearts go out to parents who have lost babies, and we hope that the good that comes from this is education and awareness is based not only on safety, but also on the benefits of babywearing. There is certainly a good reason why slings have been used for centuries all over the world for optimum baby health and well-being." For more information, read API's Statement on Babywearing Safety Concern (PDF). "At Infantino, our top priority is the safety of infants whose parents and caregivers use our products, and we highly value the trust that mothers and families place in the company's products every day. Infantino has a well-earned reputation for designing safe and enjoyable products that are manufactured to the highest quality standards. Infantino is announcing a voluntary replacement program for the Infantino SlingRider and Wendy Bellissimo infant baby carriers to address concerns raised by the Consumer Product Safety Commission (CPSC). One million of these infant slings are being recalled in the United States and 15,000 are being recalled in Canada. Our company is comprised of moms, dads, sisters, aunts, uncles and grandparents and we care deeply about the quality and safety of our products. Safety is our number one concern and today's announcement of a free replacement program reflects this commitment. As an industry leader, Infantino has also been working closely with CPSC and other agencies, as well as the international agency ASTM to develop safety standards for baby slings to ensure that these products are safe and that they are used appropriately. We will continue to play a leadership role in the industry and to cooperate closely with CPSC as it continues its investigation of all baby slings." Consumers should stop using the recalled slings immediately and contact Infantino to receive a free replacement product, including a choice of the Wrap & Tie infant carrier, the 2 in 1 Shopping Cart Cover, or the 3 in 1 Grow & Play Activity Gym, plus a Jittery Pal Rattle. Contact Infantino at 866.860.1361 between 8 a.m. and 4 p.m. PT Monday through Friday. On March 12, 2010, CPSC warned consumers against the use of all sling-style baby carriers in certain circumstances and announced that it was actively investigating all baby sling carriers to determine what additional action may be appropriate. These 8 principles do not tell you exactly how to parent your child but rather guide you as you make important parenting choices. For example, the principles of attachment parenting do not dictate co-sleeping but rather ask you to respond to your baby's night time needs quickly and with sensitivity - whether he is sharing your bed or sleeping in another room. Similarly, a bottle feeding parent can still practice attachment parenting by making sure to hold and connect with her baby when he eats rather than propping him up with a bottle in a baby swing. Read the entire article: Attachment Parenting 101: What are Attachment Parenting Internationals 8 Principles of Parenting? Our nation faces serious challenges such as child abuse, anti-social behavior and juvenile crime. In many cases, these problems can be traced to a traumatic childhood and failure of parenting. Parker explores how a more nurturing parenting method can contribute to healthier, happier children, stronger families and a safer society. According to The Children's Defense Fund, "Every day in America four children are killed by abuse or neglect, five children or teens commit suicide, 192 children are arrested for violent crimes." Further, The National Child Abuse and Neglect Data System (NCANDS) reported an estimated 1,760 child fatalities in 2007. This translates to a rate of 2.35 children per 100,000 children in the general population. NCANDS defines "child fatality" as the death of a child caused by an injury resulting from abuse or neglect, or where abuse or neglect was a contributing factor. In 2003, the Office on Child Abuse and Neglect, within the Children's Bureau, Administration for Children and Families, U.S. Department of Health and Human Services, launched a Child Abuse Prevention Initiative to raise awareness of the issue in a much more visible and comprehensive way than ever before. The Prevention Initiative is an opportunity for individuals and groups across the country to work together to strengthen families and communities. Increasingly, this effort focuses on promoting protective factors that enhance the capacity of parents, caregivers, and communities to protect, nurture, and promote the healthy development of children. Lysa Parker, co-founder of Attachment Parenting International, and co-author of Attached At The Heart: 8 Proven Parenting Principles For Raising Connected And Compassionate Children will address ways parents can practice nurturing, and thereby strengthen families and communities. It's the only baby book you'll ever need. On Friday Feb, 13, 2010 at noon at Barnes and Noble in Sacramento, Barnes and Noble Booksellers, 1725 Arden Way ,Sacramento, CA 95815 ,tel: (916) 565-0166. Barnes and Noble will be donating a portion of the proceeds to Sacramento Crisis Nursery, an organization that provides emotional and material support to parents in crisis, and helps to improve their parenting skills. Lysa Parker says, "Our book (and our organization Attachment Parenting International) provides a blueprint for childcare providers to build and strengthen the parent-child attachment relationship. The book summarizes the crises many children and families are in right now in our country and describes the fundamentals of the emotional needs of children that must be addressed if we are to stem the tide of child abuse, and deep-rooted social problems. Crisis Nurseries is providing a valuable service to stressed out parents who don't have the emotional or material resources to support them in parenting. Not only are they providing a safe, nurturing environment for the children but the parents as well, with counseling and training to help them be better parents." February 3, 2010 - Buy 1 New Membership and Receive a FREE Teleseminar plus a dedication to be displayed online in The Attached Family! Hurry! Offer ends February 28. BRISTOL, Tenn. - The high unemployment rate and the faltering economy are limiting fund-raising for Tennessee's nonprofits. The state's seasonally-adjusted unemployment rate for December was 10.9 percent, up seven-tenths of a point from the revised November rate of 10.2 percent. Samantha Gray, executive director of Attachment Parenting International, says her group understands the stresses many families are feeling right now, but hopes people realize that, even if they can only give a little, it helps a lot. "We have discovered that families are saying, 'Wow, we can't give like we used to; we believe in what you're doing; we want to keep supporting.' So, that's one of our big struggles." Nationally, the unemployment rate for the month of December was unchanged at 10.0 percent. Technology, social networks and e-mail are helping nonprofits keep in touch with supporters, adds Gray, without the cost of new equipment and expensive mailings. "We are definitely taking advantage of Twitter; we're on Facebook. We try to take advantage of every kind of free advertising. We do a lot of swaps with other nonprofits and organizations and even companies." Attachment Parenting International hopes that, as the economy recovers, so will donations and support. The organization educates and supports parents, with the goal of creating stronger, healthier families. It has four chapters in Tennessee. More information is available at www.attachmentparenting.org. Our hearts go out to the people of Haiti in this time of great tragedy and we keep them in our thoughts and prayers. So, at this point, your financial support and thoughts and prayers are the greatest help. For a project you might do with your children, contact a local group, organization, or faith community supporting Haiti by collecting and sending supplies. If you don't have a local program you can create and send relief kits here, including health kits, birthing kits, bedding kits, layette kits and more. Or with your children, undertake a fundraiser and make a donation to these organizations working in the area and receiving donations. We know that much more will need to be done and we know there will be more ways for families to be involved, such as providing shoes, clothing, even toys, and more, so you might keep this in mind for the future. "The book is written for well-educated readers and professionals. It should be required reading for daycare owners, social workers, and members of the judicial system. A simplified version would be worthwhile for parents who could benefit from the tips and message without the academic documentation." The book's advice is empowering and, if followed, could lead to a better world." January 7, 2010 - "The purpose of our column is to help parents become more aware, compassionate and connected with their children. With that in mind, we recently read a column by a psychologist who was addressing a question that a mother had written to him. She has a 13 month old toddler who had become accustomed to napping in her arms due to 'a horrible bout of teething' and still will not sleep on her own. The toddler also woke up a couple of times a night at which point the mother nurses her back to sleep."